The Boys of John Ash & Co.
Over the past year I have spent considerable time snooping around the Russian River Valley looking for those historical figures and places that have been seminal to the evolution of California Pinot Noir as we know it today. The Santa Rosa restaurant, John Ash & Co., was a recurring feature of recollections of those that I interviewed. John Ash & Co. was known for spawning numerous innovative ideas that have become commonplace in restaurants today. It was here that restaurant wine-by-the-glass service originated in California, and organized blind tastings of wines and creative wine dinners emphasizing food-wine pairings were popularized. John Ash & Co. was among the first restaurants to have a wine bar and an associated wine retail store. The culture of wine and food pairing flourished here as California wine took its true place on the table as both a compliment to food and a star in its own right. There was an emphasis on seasonality in the menus and the procurement of foods from local artisans, farmers and fisherman. Over the years, numerous exemployees of the restaurant went on to become successful winemakers, winegrowers, and key employees in various wine-related businesses. I interviewed winemaker, wine educator, wine consultant, and wine writer, Don Baumhefner, who was intimately involved in John Ash & Co. from its beginnings, and sommelier and winery owner Dan Kosta, who fondly recalls the many years he spent working at the restaurant. I have pieced together their comments to trace the history of this Sonoma County institution. The story begins with John T. Ash. Growing up in Colorado, his first exposure to food was observing the cooking talents of his grandmother. Despite the impression she made, he initially do not consider a career as a chef, attending college instead and obtaining a degree in fine arts. He became employed by a New York ad agency assisting with the development of new food products for Del Monte in the 1970s. Stimulated by this work, he left for England and France to attend professional cooking schools. It was here that he learned what was to become the basis of his life-long cooking philosophy: fresh, local and seasonal. Upon his return to the states, he worked as a chef in San Francisco before an opportunity brought him to Sonoma County. In 1976, Don and his wife Kay lived in the tiny town of Forestville, located in western Sonoma County adjacent to Russian River Vineyards where Don worked. Russian River Vineyards had been founded by Robert Lasdin in 1963, but by 1975, financial pressures forced Lasdin to sell the winery and 10 acres of vineyards. Three owners in succession took over the property, all of whom turned out to be “crooks” as Don recalls. In 1976, one of the subsequent owners wanted to revive the old restaurant, winery and vineyards on the property. He approached the Baumhefners, suggesting Kay, who was a chef, take over the restaurant, and Don who little about winemaking then, revive the winery. About this same time, winemaker and former colleague of Don’s at University of California Berkeley, Merry Edwards, was thinking about moving to Sonoma County. At a New Year’s Eve dinner party at the end of 1975 at Mt Eden Winery in the Santa Cruz Mountains, the Baumhefners celebrated with Merry Edwards (she had been the winemaker here since 1974) and her husband Bill, winemakers Joseph Swan and David Bruce, and others. As a result of discussions that night, Merry Edwards became the winemaker at Russian River Vineyards with Don assisting. A search was then conducted for a prominent chef and both John Ash and Mark Miller were interviewed. Don and Kay decided to hire John because he had a “neat carrot made out of dough on his lapel at the interview” (John’s wife made Christmas ornaments out of dough and the lapel ornament was her idea). Mark Miller, of course, went on to become a nationally recognized authority on southwest cuisine. As you reflect on the team that was assembled, it was clearly a recipe for success. The restaurant opened to much acclaim, with local Sonoma wines served by the glass, and featured innovative California wine country cuisine that brought many San Franciscans on an hour journey to the restaurant. Sadly, the operation failed after a month when the owner failed to pay all those involved. John Ash and Kay Baumhefner moved on to the Bodega Harbor Country Club, where John would cook, Kay would help in the kitchen during the day, and then change clothes to receive customers in the evening. Don, meanwhile was teaching at a Montesorri school and knew the children of Sandra Steiner (now Sandra McKeever). She was looking for a winemaker and Don recommended Merry Edwards. He told Sandra to send Merry abroad to learn winemaking and she did. Matanzas Creek was born and the rest, as the say, is history. The desire to have his own restaurant led John Ash in 1980 to Santa Rosa, where he recruited a few doctor investors, gutted an old Chinese restaurant in Montgomery Village Shopping Center, and started John Ash & Co. The phone number was 527-SOUP (7687), named in honor of the Chinese restaurant, and is still the phone number of John Ash & Co. to this day. The wine program at John Ash & Co., developed by Don Baumhefner, the wine manager, and initially the only wine employee, is passé now, but was a first for California in 1980. The philosophy was to give the customer the opportunity to taste many different wines. Twelve wines were offered by taste (2 oz.) and by the glass (6 oz, ranging in price from $1.75 to $3.25). Examples of wines sold by the glass included 1981 Kenwood Chenin Blanc ($1.95), 1980 Charles F. Shaw Beaujolais (yes, that Charles Shaw, now known as “Two Buck Chuck” - $1.95), 1980 Sausal Chardonnay ($2.50), 1979 Chateau Rieussec ($1.95 half-glass), and St. Francis Chardonnay ($3.25). In addition, patrons were offered the opportunity to purchase any wine from the restaurant’s wine store at retail price plus a $2.00 corkage fee (later raised to $3.00). An early example of the Pinot Noir stock list is on page 3. Weekly tasting of wines, usually organized by variety, were highly popular, and sometimes eighty people attended. 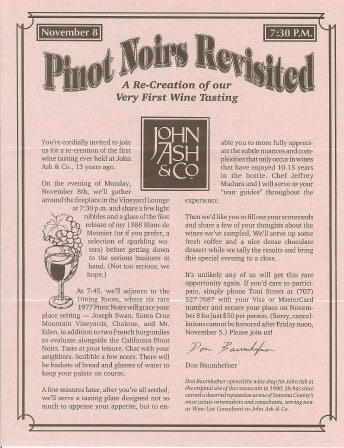 The price ($8 for Big Zinfandels to $40 for Grand Champagnes) was attractive and included at least eight wines with “kitchen treats to accompany the wines.” The theme for the inaugural wine tasting at John Ash & Co was 1977 Pinot Noirs. Billed as “The finest collection of California Pinot Noirs ever assembled,” the producers included, Joseph Swan, Firestone Reserve, Kenwood Jack London Vineyards, Chalone Young Vines, Chalone, Carneros Creek, and Santa Cruz Mountain Vineyards. A copy of a partial listing of the restaurant’s inaugural wine testing schedule is on page 4. Special wine dinners were also part of the program at John Ash & Co. from the beginning. In 1981, the second dinner was held to honor Merry Edwards. Don noted in his newsletter that “While most of you know that Merry produced what by consensus must be considered the best 1978 Chardonnay made in California, many of you may not be familiar with her accomplishments while at Mt. Eden. In 1974, she produced on of the very best Cabernet Sauvignons of that renowned vintage. In 1975, she crafted not only the best California Chardonnay Don has ever tasted, but also the very best California sparkling wine he has ever sipped. In 1976, she produced the only Zinfandel that Don has ever ranked above a Joseph Swan Zinfandel.” The menu for the dinner was drawn from recipes of talented woman (whom John Ash admired greatly), Simone Beck, best known for her co-authorship with Julia Child of the Mastering The Art of French Cooking books. The wines included a never released 1979 Matanzas Creek Sparkling Wine, and a 1975 Mount Eden Pinot Noir, called by wine critic Robert Finigan his “favorite California Pinot Noir” at the time. The late 1970s were a great period for wine enthusiasts because there was a plethora of inexpensive good wine. 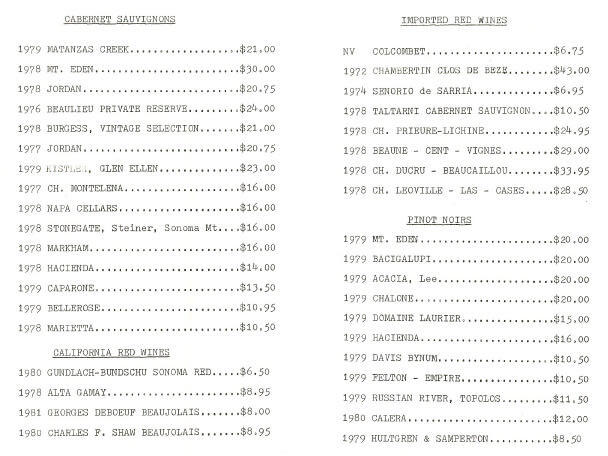 Top premier cru Burgundies of the 1970s by Dujac and Grivot could be had for $10 to $15 a bottle. When Don talks about those days, his gaze drifts off and he mumbles, “those were wonderful times.” At John Ash & Co. marvelous wine dinners featuring the 1959, 1961 and 1962 vintages were offered at $125 per person. The 1959 French dinner lineup included: 1961 Gosset Brut Integral Millesime Ancien. 1972 Domaine de la Romanee-Conti Montrachet, 1959 Chateau Pontet-Canet, 1959 Carruades de Lafite, 1959 Domaine de la Romanee-Conti La Tache, and 1959 Chateau Sudiraut. As the consulting wine list engineer at John Ash & Co., Don had to meet frequently with wine representatives. These encounters would be scheduled on one day from 10:00 AM to 4:00 PM with each wine salesman getting fifteen minutes of Don’s time. Don recalls when Steve Bixler of Kistler Vineyards came in. Kistler required a purchase of 10-15 cases, an unheard of demand at the time, and the wine was expensive. Don acquiesced and John Ash & Co. became the first commercial account for Kistler. While Don (pictured right) was managing the wine program, his wife Kay along with noted Sonoma chef Lisa Hemingway were making the pastries for John Ash & Co.. Hemingway would eventually move on and open her own restaurant. Kay currently is a chef at Della Fattoria Restaurant in Petaluma. Don left John Ash & Co. in late 1982 to manage a wine bar in San Francisco and become assistant winemaker at Joseph Swan. Don likes to jokingly reminisce about the challenges of setting up Joe Swan’s winery accounting on one of the first Apple computers. Don worked closely with Joe Swan for many years until his passing and continued to consult for John Ash & Co. He then became the winemaker at Copeland Creek and today is the winemaker at Ridgeway in Petaluma. In the mid 1980s, the cuisine at John Ash & Co. was quite inventive and original for the time and along with the wine program, brought notoriety to the restaurant. The attempt to sell wine retail at the restaurant wine bar never really took off, but the restaurant was a success in all other respects. In 1987, the Vintner’s Inn was built in Santa Rosa at 4350 Barnes Road, just off River Road by retired scientist, John Duffy. He wanted to add a topname restaurant to the Inn and brought John Ash & Co. to its current location adjacent to the Inn. Between 1987 and 1990, John Ash was recruited by Fetzer in Hopland, California to consult on their wine and food program. Building on his experience and influenced by others such as Zelma Long at Simi, an early proponent of wine and food pairing, John Ash became widely respected as the originator and teacher of wine country cuisine. In 1985, John Ash had been chosen as one of America’s “Hot New Chefs” by Food & Wine magazine so it was no surprise when Duffy chose his restaurant to provide a prestigious aura to his new Inn. A sparkling review of John Ash & Co. by Caroline Bates appeared in Gourmet magazine in September, 1988. Bates remarked, “Sonoma County, southern France, and Japan are the main currents in Ash’s cooking… .Ash’s plates are artistic, featuring sprays of flowers and sauces that look like brushstrokes… .Throughout the year Ash uses as many as seventy- five different edible flowers in his cooking… .There are few places where the good earth produces so many superlative things for the table - and attracts chefs worthy of them - as here in the Sonoma and Napa valleys of California’s northern wine country.” She pointed out that the wine list was composed of primarily local Sonoma County producers, some of which were walking distance from the restaurant, and noted that John Ash & Co. was one of the first restaurants in the United States to pay attention to after-dinner wines. In 1990, Dan Kosta began working at John Ash & Co. His father, Tom Kosta, was partners with Steve Lorenzon and Tom Bolger in a wine store in the railroad square area of downtown Santa Rosa. They were competitors during the restaurant’s Montgomery Village years. Growing up, Dan was exposed to wine with every meal and developed an appreciation for and interest in wine at an early age. At the tender age of 18, Dan joined the staff at John Ash & Co as a busboy. From the start, he became immersed in the wine and food culture that was prevalent among the staff at the restaurant. As Dan puts it, Ash was a “Petri dish” for learning about fine wine and food. One day he met Michael Browne who had joined the staff and recognizing Dan’s talent, suggested to him that he ask to be promoted. Dan quickly became a waiter, then was promoted to management, and become the restaurant’s wine director at age 24. Age was not a deterrent to success at the restaurant and Dan thrived on the continuous on-the-job training. The restaurant’s wine budget was about $100,000 a year and over 500 wines (quite large for Sonoma at the time) were on the wine list. Dan was able to taste most wines that were put onto the list and learn to match food and wine. The staff traveled to many local wineries to taste as well. In the mid-1990s, the staff added a large number of Pinot Noirs to the wine list based on Pinot Noirs acknowledged affinity for food.. Sales were slow, however, unless the wines were ‘hand-sold.” Burgundies were often the safer choice because of their consistency, but the quality of Pinot Noir from Sonoma County was growing and more and more of them were added to the wine list. The menu at John Ash & Co. was very conducive to Pinot Noir and this was also factor in the decision to promote Pinot Noir. 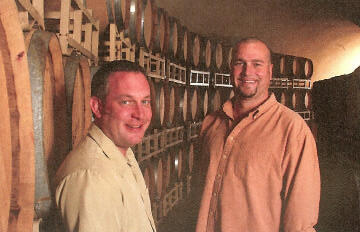 By 1990, John Ash (pictured right) had become the culinary director of Fetzer Vineyard’s Valley Oaks Food & Wine Center. He had a passion for food but was happiest writing and talking about food and was not particularly enthusiastic about the daily grid of working in a restaurant kitchen. Dan recalls that he was very impressed by Ash’s coolness in the kitchen, never seeming to be flustered or angered. He treated his employees very well, and encouraged their wine and food education. In the late 1990s, chef Jeffrey Madura joined the cooking staff at John Ash & Co and he would be the man behind the scenes keeping the quality of cooking at a high level as John Ash became more and more involved in outside projects. 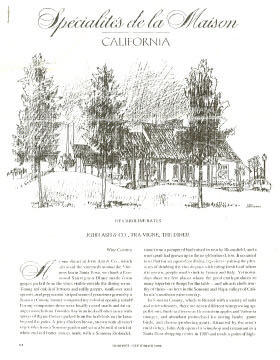 In 1999, Duffy retired and the Vintner’s Inn and John Ash & Co restaurant were sold to Don and Rhonda Carano of Ferrari-Carano Vineyards &Winery who continue as owners to this day. John Ash left the restaurant in 2000 and Jeff Madura has continued the tradition of fine wine country cuisine to the present. Beginning with Madaro’s reign, the food took on more Mediterranean influence, more simplicity, and emphasized grilling more. In 2000, a re-creation of the very first wine tasting held at John Ash & Co. was organized by Don Baumhefner. 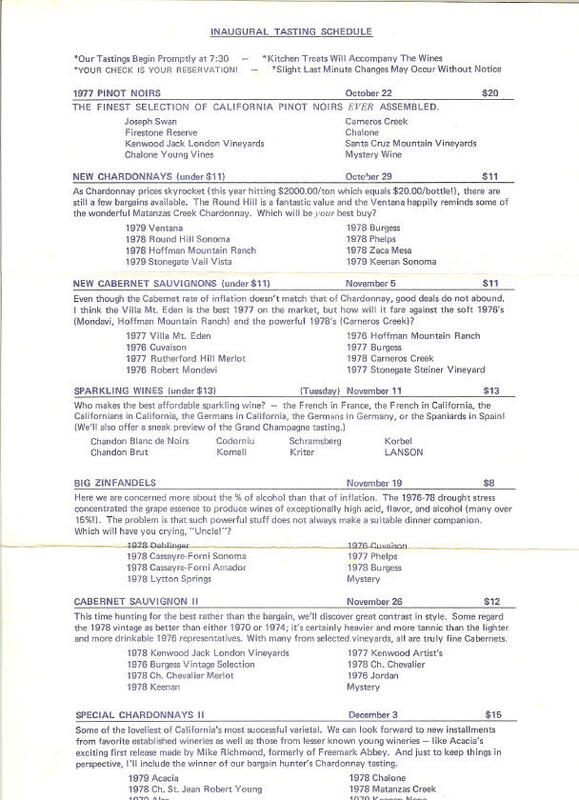 The Pinot Noirs from 1977 included Joseph Swan, Chalone, Mt. Eden, and Santa Cruz Mountains Vineyard as well as two French burgundies. According to Don, the California Pinot Noirs “were still solid,” and it was a thrill to relive this tasting. The legacy of John Ash & Co. will be the popularization of seasonal and local wine country cuisine. Working in a “hotbed” for food and wine, the employees had a tremendous exposure to wine on a daily basis. Even as a busboy, Dan was offered samples of wine to try. After work, wines, wineries, and wine styles were discussed in depth. The staff often stayed up all night discussing wines. In addition, the staff had considerable admiration for the winemakers whose wine fervor was contagious. The natural evolution was for members of the staff to leave the restaurant and produce their own wine. In this fashion, John Ash & Co spawned many winemakers through the years. During the years that Dan Kosta worked at John Ash & Co., Michael Browne came and went as a waiter at the restaurant between breaks for schooling. The two developed a close and lasting friendship founded on their shared enthusiasm for fine food and wine. In 1996, Dan was the wine director at John Ash & Co., and Michael Browne had begun to seriously consider a career in winemaking. They talked about a partnership over many dinners. Every night after work, each one would put $10 in tip money into an envelope that Dan kept in his desk. After accumulating $1,300, they purchased one-half ton of Eastside Road Pinot Noir, an old hand crank de-stemmer/crusher, old used barrels and “we were off.” Two years later, while still working at John Ash & Co., the two launched Koste Browne with the inaugural release of a 1999 Sauvignon Blanc from Lake County. They had hand-drawn the labels which remain the same today except for the colors. The first Pinot Noir from Kosta Browne came in the year 2000. The pair had contact with Sonoma growers and some 2000 Cohn Vineyard Russian River Valley Pinot Noir grapes became available to them. Michael had gained valuable experience working as a winemaker at Deerfield Ranch Winery in Sonoma Valley. They continued to develop contacts and several other prominent vineyards came on board such as Kanzler and Koplen. Their initial goal was not to attempt to make or duplicate Burgundy, but rather to create a delicious Northern California artisan beverage with as much flavor and intensity as possible. Despite their background, they did not have food and wine matching in mind when they created the Kosta Browne style of Pinot Noir, but over time they have found that their wines perform beautifully at the table with appropriate foods. Below - Michael left, Dan right. They have the perfect business relationship with Michael handling the winemaking and Dan in charge of sales and marketing. The list of prominent alumni of John Ash & Co. is lengthy but a few names should be mentioned. Matthew Gustafson was a wine buyer and sommelier at John Ash & Co., later the wine buyer for Oakville Grocery, and became an accomplished winemaker for Dutton Estate and his own label, Paul Matthew Winery. Steve Galvan, a former sommelier at John Ash & Co., is now the General Manager at Ramondin USA in Napa which produces tin capsules for wine bottles. Paul Sloan is a third generation Sonoman who had his epiphany while working as a wine steward at John Ash & Co. Restaurant. During a tasting of very expensive white burgundies, he tasted his first Le Montrachet. His interest in Burgundy wines was ignited that day and along with encouragement from his wife, Kathryn McGrath-Sloan who also was educated in wine, immersed himself in learning about wine. Together with Matt Gustafson, he won the Greenwood Ridge California State Wine Tasting Championship, Professional Division. He enrolled in the viticulture program at Santa Rosa Junior College and obtained practical experience under the guidance of Warren Dutton of Dutton Ranch. Spurred by the encouragement of Warren Dutton, Paul and his wife started Small Vines Viticulture in 1998 specializing in the planning, installation and precision viticulture of close-spaced vineyard estates in Sonoma County. His clients have included Paul Hobbs, Sonoma Coast Vineyards, DuMol, and Red Car Wines. John Ash & Co. alumnus Markus Wilson is the Key Account Specialist for Southern Wine & Spirits. In 2000, he placed second along with partner Dan Kosta in the California Wine Tasting Championship, Professional Division. John Ash continues to act as a consultant and give cooking classes at his eponymous restaurant (for a schedule visit online at www.vintnersinn.com). The restaurant today has one of the finest wine lists in Sonoma County with approximately 600 wines from the adjacent wine country and around the world. The Fourth Annual Pinot Family Reunion will be held on Sunday, June 22 from 1:00 PM to 4:00 PM. A three-course family style dinner will be paired with some of Sonoma County’s top Pinot varieties at John Ash & Co. restaurant at 5:00 PM. A portion of the proceeds will benefit the Breast Care Cancer Center at Sutter Medical of Santa Rosa. Tickets are $80 in advance, or $95 at the door, including a wine glass. The cost for both the Tasting and Dinner is $175 per person, all-inclusive. John Ash currently has two excellent books in print: Cooking One on One: Private Lessons in Simple Contemporary Food from a Master Teacher (2004) and From Earth to Table: John Ash’s Wine Country Cuisine (co-author Sid Goldstein, 2007). John Ash is also a partner in the winery, Sauvignon Republic. There are a number of cookbooks available that are instructive about on wine and food pairing. Two of my favorites are: The Vintner’s Table Cookbook: Recipes from a Winery Chef, by Mary Evely, written when she was the winery chef at Simi, (2006, second edition), and Perfect Pairings - A Master Sommelier’s Practical Advice for Pairing Wine with Food, by Evan Goldstein (2006). Back in my files I have an quote (the source of which I have lost) that is apropos for the John Ash & Co story. “Some wines really are better with some foods than other wines. Many meals can be improved by the selection of just the right wines. While wine is truly an art form, it is not so in the same sense as a painting or sculpture. It is a living entity that must be drunk preferably at its peak. A proper meal is an attempt to marry truly great wines at their peak with compatible foods prepared to perfection. Such an attempt is a celebration of the realization that wine, alone above beverages, is part of food, and neither exists in even half its glory without the other.” Chefs like John Ash, sommeliers like Dan Kosta, and vintners such as Don Baumhefner, Michael Browne, and Matt Gustafson and are an inspiration to us all, and their ability to harmonize food and wine is proof that God loves to see us happy! Kastania Vineyard and Winery is nestled adjacent to the western shoulder of Highway 101 as it meanders through Petaluma. The land here has been owned by the Smith family since the 1860s. Originally it was a sprawling ranch extending east of the Petaluma River, but was gradually sold off. The plot that remains is lovingly maintained by Hoot and Linda Smith and is quite beautiful, studded with majestic oak trees that are a few hundred years old. Overlooking the eastern portion of the Petaluma Gap and the Petaluma River, the Smith’s Pinot Noir vineyard sits on a knoll welcoming northerly travelers to southern Sonoma County wine country. Hoot planted his 5+-acre vineyard in 1995 primarily to Pinot Noir including clones Pommard 4, 115, 667 and Calera. The Calera clone never performed well here and has been replaced with a Rochioli Vineyard selection. For the first eight years, Kastania Vineyard supplied grapes for a vineyard designate Pinot Noir made by Landmark Vineyards in Kenwood. Beginning with the 2005 vintage, Hoot has kept the grapes for his own label, Kastania. Kastania means “chestnut” in Italian. Hoot said it just didn’t seem right to name the winery “Smith.” The winemaker is Leslie Cisneros, who is also the winemaker at Arista in the Russian River Valley. A newer winery and tasting room sit at the top of the property. The inviting tasting room is decorated with owl-themed memorabilia that Linda has collected over the years. Linda likes to joke that she collected owls long before she met her husband, and she “ended up marrying a ‘hoot’”. A golden owl is prominently featured on the Kastania label. I had the opportunity to taste through both the 2005 and 2006 vintages of Kastania Pinot Noir. I previously reviewed the 2005 bottlings (Volume 6, Issue 12), so this was a chance to see how the wines were progressing. The vineyard is now well established and the resulting wines are showing the complexity that comes from aged vines. 14.6% alc., 351 cases, $35. · Both 2006 bottlings are light garnet in color. The aromas of wild berries, especially strawberries draw you in and there is a little barnyard for interest. Tasty red berry including cranberry flavors with lively acidity and a razor sharp finish. Medium-weighted with reigned-in oak and gossamer tannins. 14.6% alc., 393 cases, $45. · The aromas are slightly more penetrating and persistent here with again, plenty of fresh wild berries and a little good funk. Similar flavor profile with a little more cherry notes and a more luxurious, plush mouth feel. The clean finish exhibits tangy acidity. A true reserve wine that justifies the added price and a love letter from the vineyard. Both of the 2006 bottlings are beautifully scaled and show a woman’s touch in the winemaking. 14.5% alc., 139 cases, $35. · Although the cork looked fine, this wine seemed to be a tad oxidized. The aromatics were typical of an aged wine, with a little good funkiness, raisin, cigar box and sherry notes. The flavors of raisin, sherry and marzipan carried over . The balance was fine and the finish clean. 14.5% alc., 205 cases, $45. · The nose is reserved but charming with deep, dark fruits, grilled meat and oak char. Full-bodied and fresh black cherry and black current flavors are accompanied by powdery tannins and an appealing soft texture. This wine is just beginning to emerge, although it is quite a treat to drink now. Kastania Vineyards is located at 4415 Kastania Road (entrance just south of gas station), Petaluma. 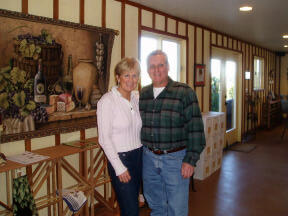 The winery’s tasting room is open by appointment (707-763-6348). The winery’s website is www.kastaniavineyards.com. I can remember clearly when I first ran into Mark Weiner two years ago at Pinot Days in San Francisco. He was at the CrushPad booth, handed me his card, and said he was starting to craft small amounts of Pinot Noir from the Amber Ridge Vineyard in the Russian River Valley. He had no wine to taste but he appeared extremely wide-eyed and eager. Mark developed his passion for Pinot Noir as a harvest volunteer at Testarossa Vineyards in the Santa Cruz Mountains. He evolved, as many do, into a home winemaker and then a commercial vintner. He founded Twin Oaks Cellars in 2005 with his inaugural vintage from Amber Ridge Vineyards and has since produced Pinot Noirs from the Santa Lucia Highlands and Santa Rita Hills as well. I have talked with him over the past year at several Pinot Noir events and never tire of his smile and enthusiasm. I reviewed his inaugural 2005 Amber Ridge Vineyard Pinot Noir in a previous PinotFile and re-tasted it again a few months ago at the Pinot Shootout in San Francisco. The wine has evolved beautifully and is just now hitting its stride. Mark graciously asked me to taste his two 2006 Pinot Noir offerings and I came away very impressed. 14.2% alc., $42. His goal with this wine was to “craft a more Burgundian-style wine versus a “syrah-style” Pinot, and manage the acids to enable the wine to be approachable earlier, yet retain its food-friendliness. · Lighter ruby in color. I like the nose for its confected bright cherry aromas. The flavor profile is layered and complex featuring Bing cherry, herbs, vanilla, and subtle spices including cardamom.. Light and soft, very clean and invigorating. Not a “hulkster” wine by any means, rather more demure. Very easy to cozy up to and it shows off Pinot’s best side. It will continue to drink well for several years. 14.2% alc., $49. Mark has had experience with this vineyard while working at Testarossa. The goal here was to highlight the smoky, earthy qualities of this vineyard using yeasts, barrels and fermentation methods to draw those characteristics out. · The aromas were quite funky initially like a barnyard covered with rotting leaves. With air time, attractive dark red fruits emerged highlighted by herbs, forest floor and smoke. The core of red fruits were quite silky and the wine, although quite understated at first, picked up power in the glass. The velvety texture was a turn-on and the finish was very clean. This will definitely be more giving with additional time in the bottle. Twin Oaks Cellars wines are sold through a mailing list and on the website. Consult the website at www.twinoakcellars.com. The website lists several winemakers who have been inspirations to Mark. Frost Threatens Wine Grapes in California I leave the country and all hell breaks out in Northern California. The worst frost season in thirty years struck Sonoma County in April. The estimated countywide damage is 10-15 percent of the crop, but is higher for certain vineyards. Dennis De La Montanya said that his large Petaluma vineyard lost practically all of its Pinot Noir and Chardonnay vines.. Some vintners used up the water in their collection ponds to prevent frost damage, leaving them with no water for irrigation later in the season. The flow of the Russian River was noticeably reduced. The frosts also hit Mendocino, Lake, and Napa counties in Northern California and parts of the Central Coast of California. Pinot Noir is particularly susceptible to the damaging effects of frost since it is an early flowering variety. Paradise Ridge Winery Re-Opens Paradise Ridge Winery is celebrating its grand re-opening and 14th anniversary with a celebration on May 18 at the winery. The fete marks the completion of an extensive contemporary renovation of the property and the opening of a sculpture exhibit at Marijke’s Grove titled “Encore” on Sunday, May 19. With one of the most spectacular views of any winery in Sonoma County and a portfolio of outstanding wines, Paradise Ridge has plenty to celebrate. The winery’s Pinot Noirs of late are highly recommendable. Green Truck Becomes Road 31 I loved Kent Fortner’s Green Truck theme for his Pinot Noir label and the story of his aged green truck. His Pinot Noir inside the bottle was memorable as well. With the current 2006 vintage, Kent has changed the name of his wine to Road 31 Wine Co.. It seems that there were just too many colored vehicles on wine bottles, so when visiting his family in Kansas last fall, he saw a sign that read, “Road 31,” heralding a gravel road which runs past his grandparents’ homesteads in Kansas. The truck still adorns the label and the wine is the same inside. The 2006 vintage of Napa Valley Pinot Noir has been released and I will be reviewing the wine in a coming issue. Visit www.road31.com. Vinquire Local Wine Search The free internet search site for wine now has a “local wine search” feature. When you are seeking a special bottle and need the bottle soon, you can enter your zip code and the wine name and quickly find a source in your neighborhood. You can even find driving directions to the retail source of the wine. I find the site extremely useful and it is updated constantly. Visit www.vinquire.com. Winemaker Changes Winemakers are similar to chefs in that they frequently change jobs, many times to gain new experience or move in another direction. Tony Rynders has departed Domaine Serene and the search for a new winemaker is ongoing. Christina Pallmann has been hired as the winemaker for Twomey Cellars (Calistoga and Healdsburg). She had previously been at Fritz Winery in Cloverdale. Greg La Follette is now less involved with De Loach in the Russian River Valley, focusing on his own label, Tandem, and a new project in the Anderson Valley financed by Chicago attorney Jim Ball. Ball is building a new winery and two vineyard sites are being developed by biodynamic viticulturalist Ginny Lambrix. De Villaine Bourgogne Aubert de Villaine (owner of Domaine de la Romainee-Conti) planted Pinot Noir on a steep hillside property in the Cote Challonaise a few years ago. 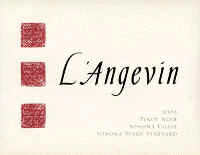 The 2005 vintage is the first release of Domaine A. et P. de Villaine La Digoine Bourgogne ($32). The wine is imported by Kermit Lynch (www.kermitlynch.com). Available also at www.storytellerwine.com in Oregon. Full Scoop on Davis Bynum Winery Retailer Paul Root is currently selling some recent close-out stock of Davis Bynum Pinot Noirs. 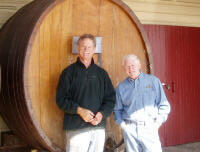 Paul is a noted historian of the Russian River Valley and he related the full story of the sale of Davis Bynum Winery (photo right) recently in his online newsletter. Davis Bynum was a home winemaker in Berkeley and worked as a reporter for the San Francisco Chronicle newspaper in the early 1950s. In 1965, he started a small winery in a warehouse in Albany, in the East Bay Area and crafted his first commercial wine here. In 1973, Bynum purchased 84 acres of land in the Russian River Valley and started Davis Bynum Wines. His winemaker was Gary Farrell who also made his own wines for many years at Davis Bynum. The label from Davis Bynum 1978 Westside Road Pinot Noir (made primarily from Rochioli Vineyard grapes) is pictured below. In 2000, Farrell left to start his own winery, and David Georges took over the winemaking duties. The Davis Bynum winery and vineyards were purchased in March of this year by the Baker family of Canada. Jeremy Baker will continue to produce wines from the property under a different name. The Klein family purchased the Davis Bynum brand and inventory in August of 2007. The Bynum wines will take on a new label and packaging and will be produced at a new small winery on Westside Road by Gary Patzwald (formerly Conn Creek in Napa. Paul Root is offering a mixed case of both the 2004 and 2005 vintages at a drastically (less than half) price. Phone Paul at Root’s Cellar, 707-433-4937. 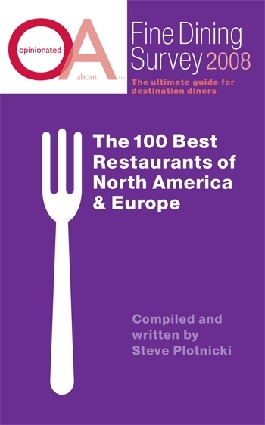 New Restaurant Guide Steve Pietnicki has published a dining guide by Opinionated About Fine Dining titled The 100 Best Restaurants in North America and Europe. Like the Zagat guide, it is compiled from diners and includes a numerical rating, a short description of the restaurant, quotes from survey participants and two to three special dishes. Unlike the Zagat guides, this book rates each restaurant’s wine list and describes the BYOB policy. The guide (a steal at $6.95) is available through retail channels or online at www.opinionatedabout.com. Wine Certification Course Noted wine educator, Kevin Zraly (Windows of the World Complete Wine Course) and Robert Parker, Jr., offer a Wine Certification Course to subscribers at www.eRobertParker.com. Beginning next year, the course will be offered to the general public as well. The current major wine certifications (Master of Wine, Master Sommelier and Society of Wine Educators) are for the trade but this course is intended for the consumer. There are three levels, each level having a test to achieve certification. Think of it as a wine SAT or wine aptitude test. The highest level (not yet available) will include a blind wine tasting and an oral exam with Kevin Zraly and/or Robert Parker, Jr.. The 3rd Annual Carneros Heritage Fest will be held on May 31 from 12:00 to 4:00 PM at the Donum Estate, 24520 Ramal Road in Sonoma, Carneros. The Fest will feature a Carneros Lamb BBQ, tasting of Carneros Wine Alliance Member wines, a young chef competition, musical entertainment, sheepherding and falconry demonstrations, vineyard tours, and sustainable agriculture exhibits. Participating wineries include: Acacia, Artesa, Bouchaine, Buena Vista Carneros, Ceja Vineyards, Clos Du Val. Cuvaison Estate Wines, Etude, Gloria Ferrar Caves and Vineyards, Havens Wine Cellars, Madonna Estate, MacRostie Winery, Merryvale Vineyards, Nicholson Ranch, Patz & Hall, Ravenswood, Donum/ Robert Stemmler, Saintsbury, Schug Carneros Estate Wines, Talisman Wines, and Toad Hall Cellars. 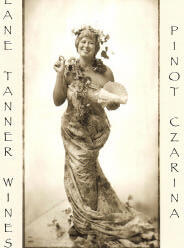 Tickets are $75 per person and are available from the Carneros Wine Alliance website, www.carnerosheritagefest.com. This event on May 24 is a fundraiser for Papermill Creek Children’s Corner and is limited to 20 people. Double Delight is the theme with 2004 Devil’s Gulch Marin Pinot Noir from both Sean Thackrey and Dutton-Goldfield, 2005 Merlot from both Mt. Tamalpais Vineyards and Stubbs Vineyards, and Marin Riesling from both Pey-Marin Vineyards and Willowbrook Cellars. A multi-course dinner will feature meats and produce from Devil’s Gulch Ranch prepared by Daniel and Margaret from Manka’s Restaurant in Inverness. For tickets, contact Mark at 707-953-0923 or mark@devilsgulchranch.com. The 4th Annual Marin County Pinot Noir Celebration, a benefit for the Marin Agricultural Land Trust (MALT), will be held at the historic Escalle Winery, 771 Magnolia Ave, Larkspur, on Saturday, June 14, 2008, from 2:00 to 7:00 PM. Local artisan foods will be served and Marin County wines will be featured. Wineries participating include Corda Winery, Dutton-Goldfield Winery, Kendric Vineyards, Orogeny Winery, Pey-Marin Vineyards, Sean Thackrey, Stubbs Vineyard, Thomas Fogerty, Vergari, Vision Cellars and Willowbrook. Tickets are $50 and include valet parking. For tickets, phone 707- 953-0923 or online at www.brownpapertickets.com. Sta. Rita Hills Open House Weekend The Sta. 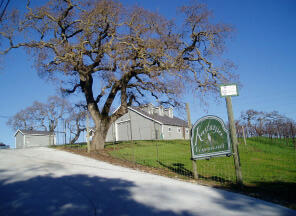 Rita Hills Winegrowers Alliance will be holding an Open House June 21 and 22. The weekend will include Saturday morning vineyard walks, Open Houses at wineries on Saturday with an emphasis on the 2007 vintage, and a Gala Reception at the Sanford & Benedict Vineyard from 4:00-6:00 PM on Saturday where members of the Alliance will be pouring their latest Pinot Noir and Chardonnay releases. Winerower Dinners at Clos Pepe Estate and Pali Wine Co. will be offered Saturday night. On Sunday, there will be additional Open Houses at wineries focusing on library wines and current releases. The legendary Fiddlefest will be on Sunday as well at Fiddlestix Vineyard (for tickets to this event, visit www.fiddleheadcellars.com). A two-day passport is $75 per person. Visit www.staritahills.com. A research paper was published in the April, 2008 edition of the American Association of Wine Economists Journal titled, “Do More Expensive Wines Taste Better? Evidence from a Large Sample of Blind Tastings.” The authors (Robin Goldstein, Johan Almenberg, et al.) found that individuals who are unaware of the price do not derive more enjoyment from more expensive wine. In a sample of more than 6,000 blind tastings, the correlation between price and overall rating was small and negative, suggesting that individuals on average enjoy more expensive wines slightly less. For individuals with wine training, however, there were indications of a positive, or at any rate non-negative, correlation. The results of the study indicate that both the prices of wine and wine recommendations by experts may be poor guides for non-expert wine consumers. I awoke after our previous night’s revelry at Domaine Bertagna and decided to walk off the Pinot lovely hangover. I started to think that I had died and gone to heaven. Many would remark, “give me a break, it’s only a bottle of wine.” Right, and a Ferrari is only a car and the Rolling Stones are just a rock band. Some things just become the standard by which all else is measured, and I realize for Pinot Noir, that standard is Burgundy. Although California Pinot Noir compares favorably in many cases with Burgundian wines, many are to Burgundy what the World Wrestling Federation is to athletics. This is not to say that we should spend needless energy on comparing North American Pinot Noir to Burgundy. They should both be enjoyed for the qualities that they exhibit, and to suggest they are comparable is a disservice to both. A visit to Burgundy is magical. The rich simplicity of each Domaine’s houses and the purity of line of the stone enclosures surrounding the vineyards clings to my memory. The history, tradition, and intimacy of the beautiful farm-based countryside make the wines seem even more magical. Some people call Burgundy “liquid silk,” others say it is as close as you can get to a romantic interlude with your clothes on. In either case, fine Burgundy is a kaleidoscope of flavors and heady aromas that will spin your head around, set your pulse racing, and leave your totally at peace with the world, if not a bit breathless. Every dedicated pinotphile seems to have begun their journey of discovery after tasting a remarkable Burgundy. I am no exception and my travel to the “motherland” only reinforced my epiphany.